Home News Krewe of Dionysos Parade rolls Saturday at 6 p.m.
Krewe of Dionysos Parade rolls Saturday at 6 p.m. 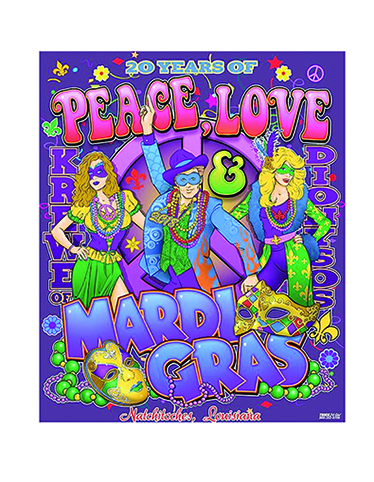 The Krewe of Dionysos Mardi Gras Parade will start at 6 p.m. at the River South Common shopping center parking lot on South Drive. The floats will turn right onto South Drive to Keyser Avenue, then left at Keyser Avenue, go across the bridge and turn right on Jefferson Street. The parade will continue down Front Street to Washington Street, turn left onto Texas Street and left again onto Second Street to Church Street to end the parade. Due to forecasted bad weather, there is a chance the parade will be canceled. Stay updated at www.natchitochestimes.com, the Times Facebook Page and the Krewe’s Facebook Page. For more information, visit kreweofdionysos.org.